This note has been in my to do folder for a while since I found these two excellent blog entries about Deferred Segment Creation by Chistian Antognini. Deferred segment creation is available from Oracle 11gR1. From Oracle 11.2.0.2 this becomes the default, so there is no need to reconfigure anything in PeopleSoft in order use this Oracle feature. You may want to drop empty segments created under previous versions of the database. This note started out as an idea for how to add more priority levels to the PeopleSoft Process Scheduler to improve control over prioritisation of processes in a complex batch. While testing I found some interesting behaviour that I had not expected. I will also explain how I did some of my tests, because they are easily reproducible. By default, PeopleSoft process can be given priority 1 (low), 5 (medium) and 9 (high). If the Process Scheduler is too busy to start all the processes scheduled to be started, it starts the higher priority ones in preference to the lower priority. That’s fine, but sometimes in a very complex batch environment 3 process levels are not enough, and it would be useful to have more priority levels so that it is possible to define the hierarchy of processing to a finer level. There does not appear to be anything special about the priorities delivered by PeopleSoft. They do not appear to be hard coded anywhere within the SQL submitted Process Scheduler. As you might expect, some of the queries are sorted in descending order of priority. The new priorities can be assigned via the delivered components. I started with the intention of applying the new priority level to processes through the delivered component. However, I encountered some quirky behaviour from the Process Scheduler and Master Process Scheduler. There is something happening inside the programs rather than the SQL where they do not always take the process with the highest priority if that priority is not one of the delivered values. Therefore, I do not recommend using the new priorities on process definitions. However, Server Categories also have priorities. Testing has shown that the priority of the Process Category take precedence over the priority on the Process Definition. Then priorities and maximum concurrencies can be assigned to the categories in each Process Scheduler Server definition. I have (with some assistance) constructed a simple test harness. I have an Application Engine program, AE_SLEEP, that does nothing, but sleeps for a period of time by calling the Java Sleep() method in a PeopleCode step. I have a number of other Application engine programs that have different priorities, or that are in categories with different priorities, that call AE_SLEEP. So the AE_SLEEP_RUN will schedule one process every 5 seconds. The lowest priority processes are scheduled first. I can query what actually happened with the following SQL. In all of the examples below, the first three low priority process run first because they are scheduled to run and therefore start before the higher priority processes are scheduled. The Process Scheduler is then blocked until all the other processes are due to have run, and so priority determines while processes the scheduler starts next. However, due to a quirk in Process Scheduler, the processes are not assigned to the Process Scheduler in time order. In the following example AE_SLEEP5 was executed before AE_SLEEP6. But if the non-standard priority jobs are put in a different category, they are executed in the right order. It would appear that there is some logic in the Master Process Scheduler (and not in the SQL queries it submits) that works category by category. If there are two new priorities in the new category, then they do not run in the right order. However, if I create a separate category for each priority, and assign the priority to that category in the server definition, then the processes run in the desired order. The Process Scheduler does not reliably take process priorities into account when scheduling processes and so I do not recommend using the additional priorities on processes, just the three delivered priorities (1, 5 and 9). However, all the priorities do work properly on process categories. The priority of the server class does not appear to have any effect (I have not produced results for those tests here). The priority of the category to which a process belongs takes precedence over the priority of the process. Thus a low priority process in a high priority category will be executed by the Process Scheduler in preference to a high priority process in a low priority category. Naturally if two processes are in the same category, or categories of equal priority, the higher priority process will be scheduled first. My thanks to Andy Mason of Business Integrations for contributing to the initial concept and the Java code to make Application Engine sleep and assistance with the test harness. I have published a paper on my website that describes how to extend this technique to model a real production batch, and predict the impact of Process Scheduler configuration changes. In a previous blog entry, I discussed how to detect whether an Application Engine process had run out of non-shared Temporary Table instances by querying the message log table for the entries written when this happens. This can happen because processes that have locked all available non-shared table instances are currently processing. However, if a restartable Application Engine program terminates with an error, the tables remain locked to that process instance so that it can be restarted. If that process instance is neither cancelled nor restarted so that it subsequently runs to success then the tables will remain locked, and in time the Process Scheduler archive process may purge the process request record. However, that archive process does not unlock the temporary table instances (by deleting the registration of the table with the instance from the record AETEMPTBLMGR), and once the process request has been deleted it cannot be cancelled in the Process Monitor. Therefore, there is no way for an operator to unlock the tables via the web interface. Over time this can build up and new processes are forced to use the shared instance. In my experience this is more common on development and test environments than production. The problem is that is a silent and insidious problem that can gradually degrade batch performance. Forcing processes onto the shared instance forces them to delete rather than truncate working storage tables. So there is additional redo, and high water marks are not reset. Concurrent processes can contend as they share the same physical table. There may be more work to preserve read consistency, and more activity on the undo segment. The way to prevent this problem is, of course, to make sure you have sufficient instance of temporary table, but before you create new instances check that there an no existing instances that should not still be locked. Update 7.3.2011: Phil's comment below correctly reminds me that PeopleSoft provided a way to remove locks without issuing SQL directly at PeopleTools -> Application Engine -> Review Temp Table Usage. This component clears records from PS_AETEMPTBLMGR, PS_AERUNCONTROL and PS_AERUNCONTROLPC. 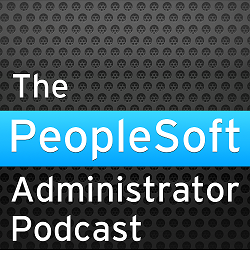 This feature is also described at PeopleSoft Tips & Notes: PS_AERUNCONTROL. However, you can only remove locks for one process instance at a time. If the problem has got out of hand, you might still chose to delete the rows from these three table where there is no longer a process request record. In PeopleSoft for the Oracle DBA (Ch11, p309) I commented on how PS/Query will automatically add effective date criteria to and EFFDT column, even if it is not a key column. If EFFDT is not part of the key, then it is unlikely that you will need this processing. It is unlikely to change the result of the query, and it incurs additional work. Below is an example of the code added to a query by this one criteria. The effective date sub-query will be correlated by the key columns prior to the EFFDT column. If EFFDT is not part of the key, then all the key columns will be used for the correlation conditions. There is only one row for each EMPLID and EMPL_RCD, and the effective date sub-queries will find and return that row, and the result set will remain the same. But how prevalent is this problem? Like most things in PeopleSoft, Queries are stored in the PeopleTools tables. And it is possible to construct a query to identify queries with effective date criteria on EFFDT columns that are not part of the key on their record. On my HR demo database the following delivered queries have effective date criteria on EFFDT columns that are no key columns. Now, it is possible to review these queries and manually remove the effective date processing if that is appropriate. My apologies in advance, but this entry is a bit of a rant. It is one of those things in PeopleSoft about which you do nothing, but it still is interesting to know because it reveals something of how it works under the covers. In the PeopleSoft for the DBA, I commented on how the columns updated in the UPDATE statements issued by the Component Processor at save time contain only the fields that have been updated in the component. You get different update statements depending upon what you update in the component, but the alternative is to update all the columns, possibly to the same value, and that would generate additional unnecessary redo. PeopleSoft uses 'optimistic locking'. That is to say that it hopes that the data in the database underlying the component hasn't changed between the operator querying data into the component and saving any changes. At save time, the data is requeried so it can be compared with the results returned by the first query, but this time the row of data is locked by adding the FOR UPDATE clause. The lock is released by the commit at the end of the save time processing. You have the overhead of requerying the data, but it is likely to be in the buffer cache after the first query. However, this avoids the risks of holding a database lock while the user is in the component. This is a common approach in many applications. It is not just reasonable, but essential for scalability. The Component Processor never holds a lock while waiting for the user to respond. This is also essential for the Tuxedo application server. Each server process is stateless and each service request is atomic. Each server process maintains a persistent database connection. A database transaction is never left uncommitted at the end of a service request. There is no guarantee that the next request from the same user will be handled by the same application server process, and it might have to handle requests from other users in the intervening period. However, PeopleSoft also dynamically generates the column list in the FOR UPDATE clause. Here are two examples from the timesheet component in Time & Labor. I have removed most of the select clause for readability. This is a totally unnecessary complexity. Oracle (and other databases) employ row level locking. They do not lock individual pieces of data. The row would be just as locked with one column in the FOR UPDATE clause as with many or any other. PeopleSoft could simply have put the first column from the select clause into the FOR UPDATE clause. Instead, we have different SQL statements with different SQL_IDs, and everything that goes with that. However, there is nothing you can do about this, just know about it. It shows the dynamic nature of the SQL generated by the Component Processor, and reveals how it must be tracking which fields have been updated by the user and the PeopleCode in a component.